Is it possible to expand an Amiga 500 rev 8 (not an Amiga 500 plus) to 1.5 MB of Chip RAM using an A501+ expansion? It is plug and play or are modifications required? Update: I wrongly thought the A501+ had 1MB of RAM. So the question is more like "Is it possible to expand Amiga 500 rev 8 to 1.5 MB with a 1MB trapdoor expansion?" Multiple sources on the internet point out that Rev 8a is indeed an Amiga 500 Plus and not a regular Amiga 500. And your picture clearly shows A500+ printed on the board. So I guess it can be said you own an A500 Plus, just with a 2MB Agnus but 512KB of memory. Does it have an on board clock chip and battery, out of curiosity? The A500Plus service manual (http://www.gamesx.com/wiki/lib/exe/fetch.php?media=amiga:amiga_500plus_-_service_manual.pdf) points out that the A501 and A501Plus use the same PCB, just the A501Plus does not have the clock chip and battery soldered in. 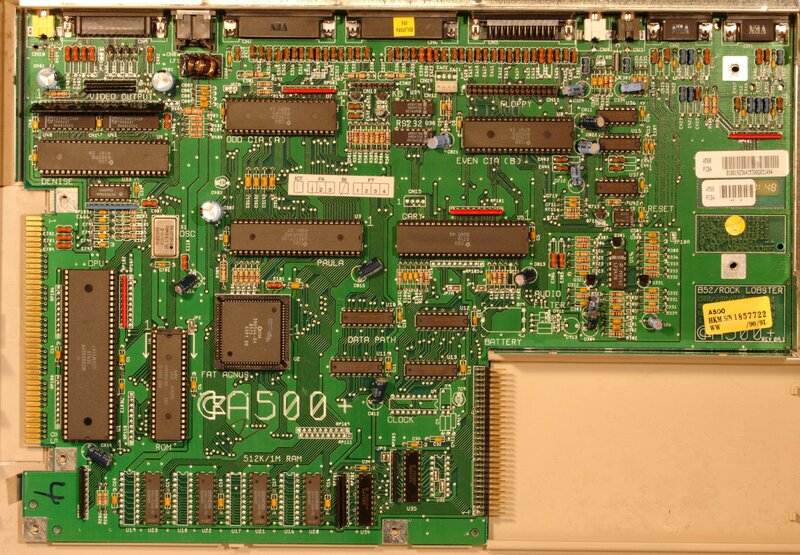 It also states that the original A501 can be used both on an A500 (where it will result in the 512KB chip + 512KB slow fast memory configuration) and on an A500Plus (where it will be mapped in chip ram - I assume to give 1.5MB of chip ram, since the rest of the document describes the regular A500Plus with 1MB on board). It does not say anything about what happens with an A501Plus on an 512KB A500Plus. Additionally, at the end, the list of jumpers in the schematics have a "JP2" jumper that selects between "C0 vs. 08 address map" (0x00C00000 being the slow-fast RAM, 0x00080000 the second Megabyte in chip RAM). Also a JP4 seems to select between 512KB and 1MB on board memory (so a 512KB Amiga 500Plus is indeed a supported configuration except it was never officially released??). My guess is that hardware-wise, you should be able to mount an A501 Plus in your Rev8a board with 512KB, and that you don't really risk damaging anything. However, again, this is just a guess, so you may want to wait for other answers. However, you probably still won't get 1.5MB chip RAM because, at least in the leaked Os 3.1+ source code (and there's no reason to believe earlier version to behave differently), Exec checks for Chip ram earlier during boot by starting at location 0 and probing every 16KB for memory and exiting as soon as the test fail, and finally creating one (and only one) node in the free memory list for the (continuous) area of Chip RAM that it found. or solder the missing 512KB of chip ram on the motherboard, fit the A501Plus in to turn it in a regular 1MB A500Plus + 1MB A501 Plus system. Any memory card added to the expansion bay will only show up as slow RAM, by default. To increase the amount of chip RAM you would need to make modifications. To get more than 512KB of chip RAM you need to add the missing RAM to the motherboard, and to get more than 1MB of chip RAM you also need to add the missing 74F(AS)139 at the unpopulated U32 location (this chip is what decodes the upper 1MB of chip ram). This is what I think is the right answer. Anyway, I would like to have some feedback before selecting it as the right answer. Therefore internal and external banks have CAS selected at the same time. NOTE: CPU address space 0x000000 to 0x07FFFF is mapped to TWO banks at the same time. But this should not be a problem since lines are driven to the same logic levels. So, 1MB of chipram is available. So there are 1.5MB of ChipRAM but AmigaOS will not recognize the 1MB at 0x100000 because not contiguous. OS Patch or post-boot command needed. So the a501+ is masked by the internal DRAM, 1MB of ChipRAM. Not the answer you're looking for? Browse other questions tagged hardware amiga amiga-500 or ask your own question.